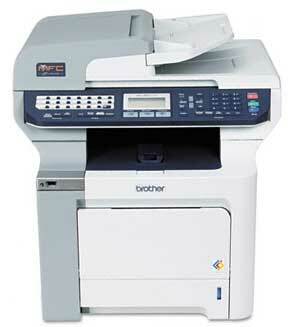 The Brother MFC-9840CDW is a multifunction color laser printer, copier, scanner, and fax machine with wired and wireless networking capabilities. It doesn’t come cheap, but if you’re looking for a versatile machine that does its job well, the MFC-9840CDW is a worthwhile investment. It can be a little tricky to use—especially when you’re setting up wireless printing—but you end up with high-quality output that’s produced quickly. Setting up the MFC-9840CDW was a breeze. After powering up the machine and installing the toner cartridges, you have three connection options: Ethernet, USB 2.0, or 802.11b/g wireless. Connecting via USB is as simple as it sounds. And when we plugged in the device via Ethernet, the MFC-9840CDW automatically appeared as a Bonjour printer. The trickiest connection setup was the wireless, which required setting up IP printing. The user manual, however, does a good job of directing you through this process. The MFC-9840CDW is ideal for medium-sized workgroups. The MFC-9840CDW’s control panel is well designed and clearly labeled. Three large buttons allow you to choose between the fax, scan, and copy functions. The control panel consists of rubber buttons that are pleasant to use, and a bright, backlit LCD clearly displays the settings you can choose from. The MFC-9840CDW includes a convenient automatic document feeder to make copying easy. A nice bonus is the ability to copy double-sided documents by pressing the Duplex button. Disappointingly, the included scanner software doesn’t offer very flexible scanning options. It is, however, easy to use and straightforward. The MFC-9840CDW outputted very good results overall, impressing our panel of experts. Text quality looked clean and professional, earning a Very Good rating. In our test print of a picnic photo, the colors overall were on the lighter side, but the image looked pleasing overall, earning another Very Good rating. The scanner’s output looked slightly dark compared to our control image, but the device captured fine details and the overall image was clear and realistic. The MFC-9840CDW’s copier received a Good rating: in a test copy of a Macworld magazine cover, some details got lost, and blacks looked slightly dull. The MFC-9840CDW’s print speeds were impressive. It took just under 40 seconds to print a ten-page Word document, and 15 seconds to print a one-page Word document. Color scanning was a bit on the slower side: it took 1 minute and 11 seconds to scan an 8-by-10-inch photo at 600 dpi. On top of being an excellent all-around MFP, the MFC-9840CDW includes bonuses such as a duplexer and wireless connectivity that make it a great value. Creative Mac users would appreciate more-advanced scanning software, but the MFC-9840CDW’s high-quality prints and scans should alleviate such concerns to some extent.